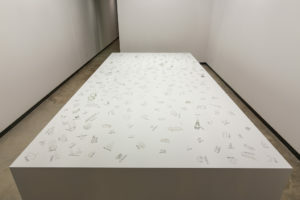 James Harris Gallery | Gary Hill: "ALOIDIA PIORM"
James Harris Gallery is pleased to present our second solo exhibition by Gary Hill: ALOIDIA PIORM. 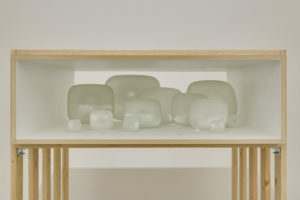 This exhibition will feature a unique combination of mixed media installation and glass sculpture. The core of the works on display were inspired and created during a residency at the Pilchuck Glass School. This is the first solo show in our new gallery that the artist will use all three exhibition spaces. As you enter, hundreds of glass fragments stretch out across a large tableau with each piece having a corresponding word as its name. 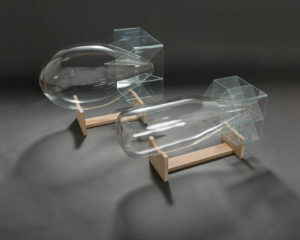 Hill has intuitively developed a sprawling lexicon for these glass shards– debris cast off from other’s glass projects. Consistent with the artist’s interest in language, Hill’s morphing classification “system” demonstrates the relationship and confrontation between images and words. His longstanding interest in language stems from the sculptural notion of sound and its relationship to the body and utterance. Hill has consistently sought to undermine his visceral creations through dialect and written expression. As Hill states, “Video embodies a reflexive space of difference through the simultaneous production of presence and distance.” The result of this creation is a reality more inclusive than text yet still promotes a discussion between the two elements. On the left and right sides of the entrance, are sculptural glass depictions of the Fat Man and Little Boy atomic bombs. This technological advancement brought devastation to Japan during the close of WWII. Created from translucent glass, the sculptures are imbued with fragility while opaquely emphasizing their contents of destruction. A special performance event will be separately scheduled during the exhibition (time /site TBD) where a Fat Man will be dropped and recorded with a high-speed camera. The bomb’s downward path and eventual detonation is seen in ultra slow motion becoming charged with hyper anticipation; Hill has created a metaphor of technology, simultaneously showing its wonders, fragility and destruction. In another work, Hill revisits his work from 1990 titled, Inasmuch As It Is Always Already Taking Place but now each of the 16 video monitors have been blown from glass, completely negating their function. In the original work the cathode ray tubes display a fragment of the body in its actual size, yet ignore all logic in organization of the human skeletal framework. Each monitor acts as a vessel, completely enclosing and individualizing the image. The monitors range in size from 1/2 to 23 inches. The monitors have now become disembodied simulacra—a trace or afterimage of what was before, perhaps a comment on shifting technology or the impermanence of human interaction that new interfaces have created. 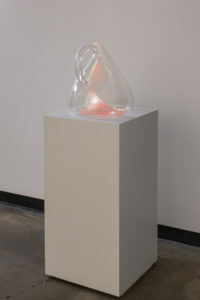 In Klein Bottle with the Image of Its Own Making (after Robert Morris), 2014, Hill has made a video recording of the bottle being made and projected it “inside” the form, a direct reference to Robert Morris’s Box with the Sound of Its Own Making, 1961. Concluding the show is Sine Wave (the curve of the world), a mixed media installation from 2011. 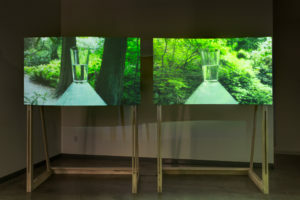 This piece shifts the tone of the exhibition to the idyllic as it depicts a half-full glass of water and its double (half-empty) shifting through the landscape. This precarious movement acts as an epilogue to the previous works on display. Gary Hill currently lives and works in Seattle, Washington. Widely considered to be one of the central figures of media art, Hill has been producing works since the 1960s’. He has had major international solo exhibitions at the Barcelona Museum of Contemporary Art, Centre Georges Pompidou, Paris; Stedelijk Museum, Amsterdam; Fondation Cartier pour l’Art Contemporain, Paris; Museum für Gegenwartskunst, Basel; Museum of Contemporary Art, Taipei and the Kunstmuseum in Wolfsburg among others. In the United States, Hill has had several survey exhibitions including the Guggenheim Museum, New York, San Francisco Museum of Modern Art, Hirshhorn Museum, Washington D.C. and most recently at the Henry Art Gallery in Seattle. His works are included in many permanent collections both in the United States and abroad. He has received commissions from the Seattle Central Library, Coliseum and Temple of Venus and Roma in Italy, the Science Museum in London and the new San Diego Public Library. He was recently commissioned by the Lyon Opera House to direct Beethoven’s only opera Fidelio that premiered in March 2013 and was again featured at the Edinburgh Festival in August 2013. 84" x 64" x 40 1/2"
Fat Man: 20 1/4" x 20 1/4" x 33" Little Boy: 13 1/4" x 13 1/4" x 36"